This Galaxy (courtesay of Wikipedia Commons) is one of the largest things in God's known Universe and is a Fibonacci Pattern! Go Here to learn more about the Fibonacci Pattern!. Go Here for an alternate view of the universe! Note that I do not endorse this view but it is gaining traction on the Internet! PLEASE , click on this handy little map and show me where you are visiting from. You can see where I live, also! If the region you are located in is becoming congested, click on "zoom" once or twice to give you space to post your location or to see other's locations. Put your City and State, also, even though I didn't do that! I'm located in Troy, Missouri! This is one view of GOD as He looks at His Universe. Of course those of us who have His Holy Spirit inside of us have a closer relationship than this! Anyway, this nice view of a galaxy is our small view of His universe. Even though it is still sad that we have such a limited view of His universe, because He tells us over and over in scripture that He made it for us to spend eternity exploring with Him! This page is intended to present more information on how large His universe is (this one anyway and He may have more) to help us understand that there is ample room for us to spend eternity many times over exploring it, assuming that is what we want to do once we are with Him. We, also, want to show proof that He created this universe, specifically for us! The belief that the universe evolved from the Big Bang Theory agrees with the the Copernican Principle (we are not in a special place in the universe), put forth by Nicolas Copernicus, approximately 500 years ago, has come under fire by what seems to confirm the origin of the Cosmic Microwave Background (CMB) radiation! Three different satellites have been launced, 1989-2013, to try to confirm that CMB is uniform, thoughout the universe. There were three launched, not only to get more accuracy but to try to obtain different results than what were first obtained. Lawrence M. Krauss, Theoretical Physicist, probably says it best, increduously however, what the implications of the findings could reveal. "But when you look at CMB map, you also see that the structure that is observed, is in fact, in a weird way, correlated with the plane of the earth around the sun. 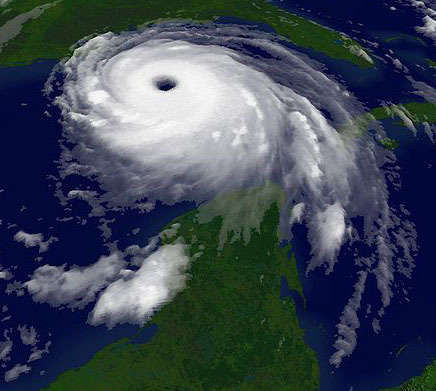 Is this Copernicus coming back to haunt us? That's crazy. We're looking out at the whole universe. There's no way there should be a correlation of structure with our motion of the earth around the sun — the plane of the earth around the sun — the ecliptic. That would say we are truly the center of the universe". Go Here for the rest of the article. From Wipedia, "The "Axis of Evil" is a name given to an anomaly in astronomical observations of the Cosmic Microwave Background (CMB). The anomaly appears to give the plane of the Solar System and hence the location of Earth a greater significance than might be expected by chance – a result which appears to run counter to expectations from the Copernican Principle." And this article, which as a retired engineer, I can appreciate, suggests there is "engineering" behind our vast universe! Normally, information from scientific discoveries is funnelled into the development of engineered products that benefit humanity. But recently a strange turnabout in the flow of practical information has occurred. Concepts from the field of engineering have been found extremely useful in areas of science. From the very large aspects of the universe (i.e. big bang cosmology and galactic and stellar evolution) to the very small aspects (i.e. the fitness of the chemical elements and the coding of DNA for life), the cosmos is so readily and profitably reverse-engineered by scientists and engineers as to make a compelling argument that it was engineered in the first place. So to combat the mere mention that God might be behind the Universe's creation, Satan is doubling his efforts to discount this! Also, he is working overtime, now that his time is nearly up (go to here if you do not believe this) , to convince unbelievers and even christians that, even if heaven exists, it will be very limited and boring and the last place anyone, with half a brain, would want to go, for even a short time. He then makes us believe that this vapor of existence on earth, is all there is or least the only part that will be enjoyable, where we can "grab the gusto." In the Old Testament, Job, who everybody, even unbelievers have heard of, knew and appreciated God's infinite universe. And this was without the knowledge of space exploration that we have. But the image below says it best. 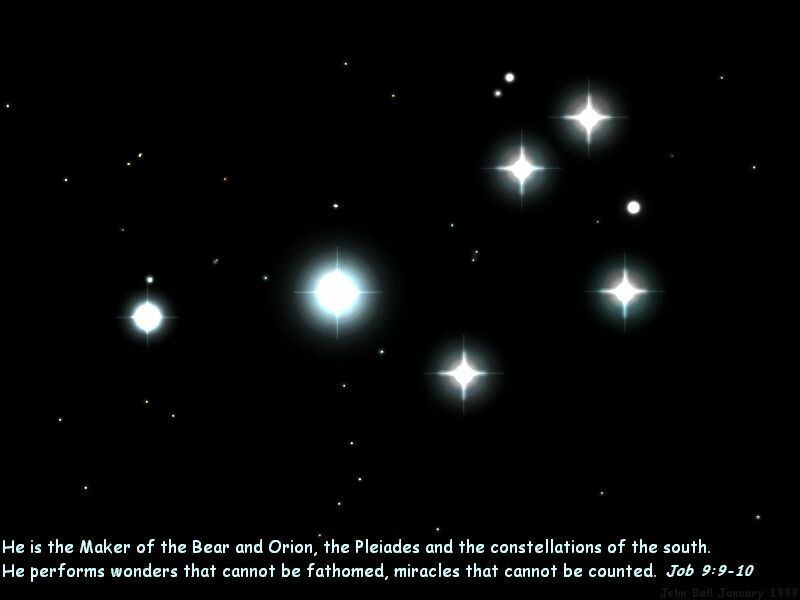 The following is an interesting sidebar of how God discussed Astronomy (not Astrology) with Job. We all learned in grade school that we live in a Solar System, with one star (sun) and 9 planets, all rotating around the sun. See the pictures below to refresh your memory. 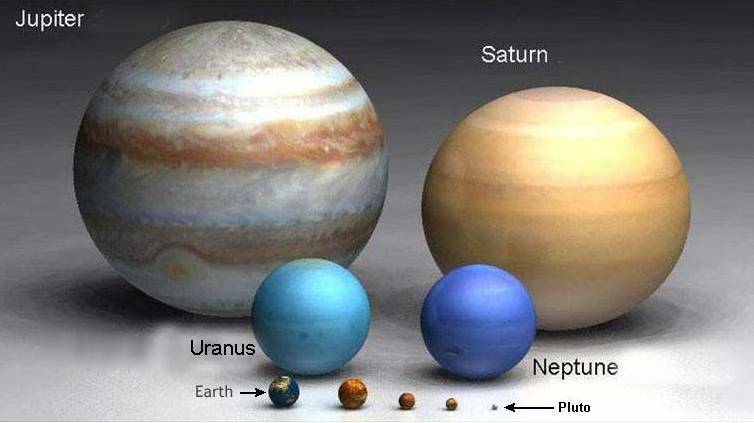 The planets are not shown in their actual order, but aligned according to size. 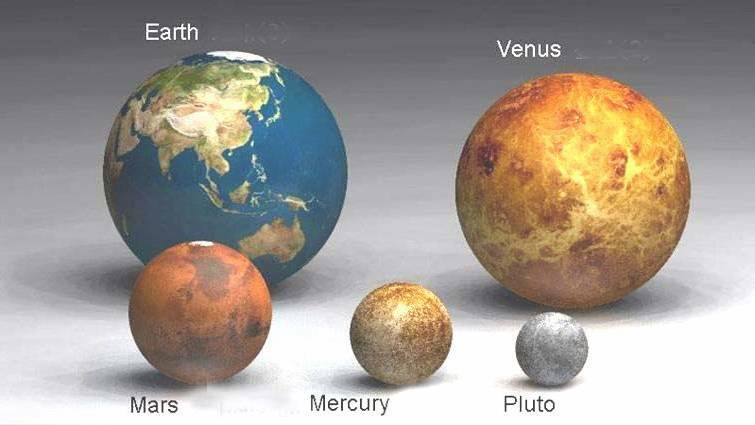 The next picture shows the size of the earth compared to the smaller planets. 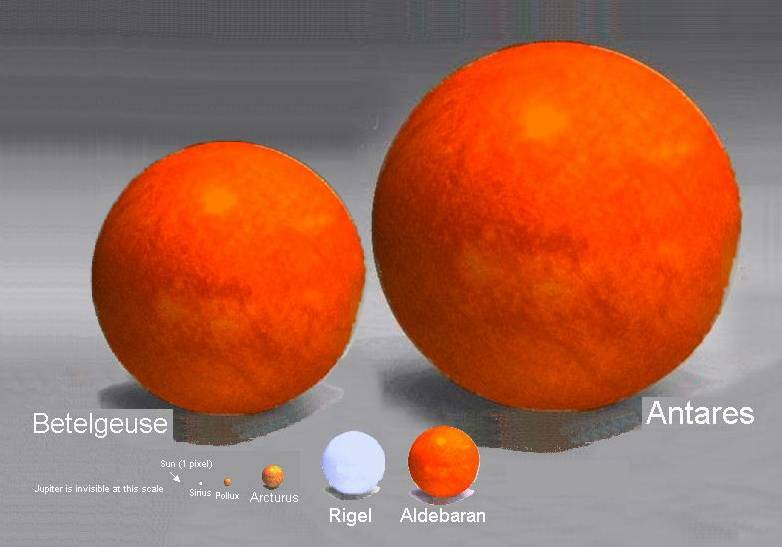 The next picture shows the size of our solar system planets compared to our only star, the sun. 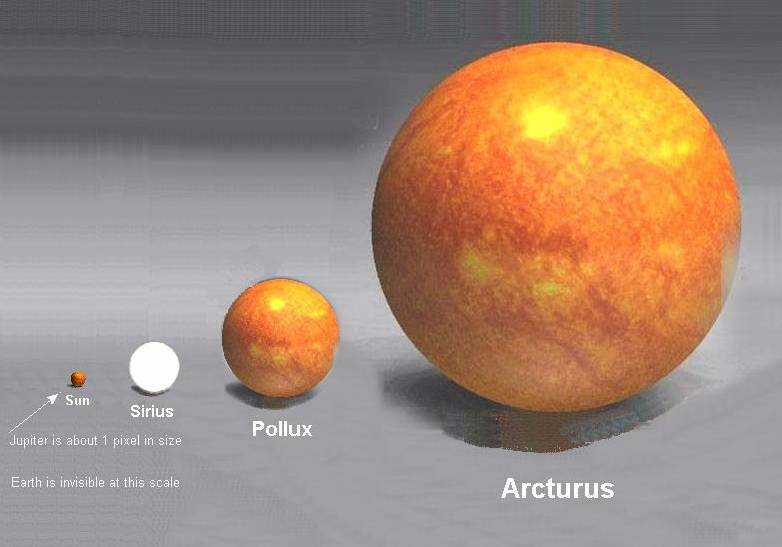 The next pictures show our sun's (star) size relative to much larger stars in the universe. Notice the large star, Betelgeuse! And we thought Betelgeuse was, Michael Keaton, from the movie! 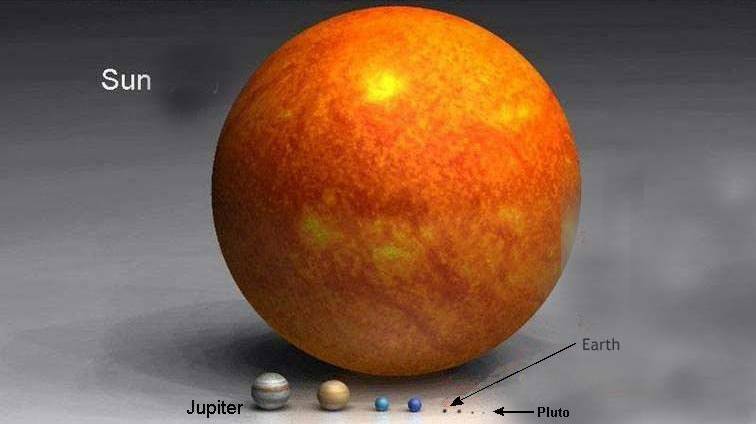 At any rate, this puts in perspective how small our sun is and now lets look at a comparison that shows, what we think is a vast solar system, is not even a spec in astronomical terms. Our knowledge of our solar system is pretty much where most of our understanding stops or gets fuzzy! This is only a small beginning, however! 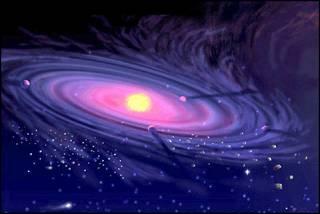 Our solar system is in a galaxy called the Milky Way. Most people know this but don't understand it. 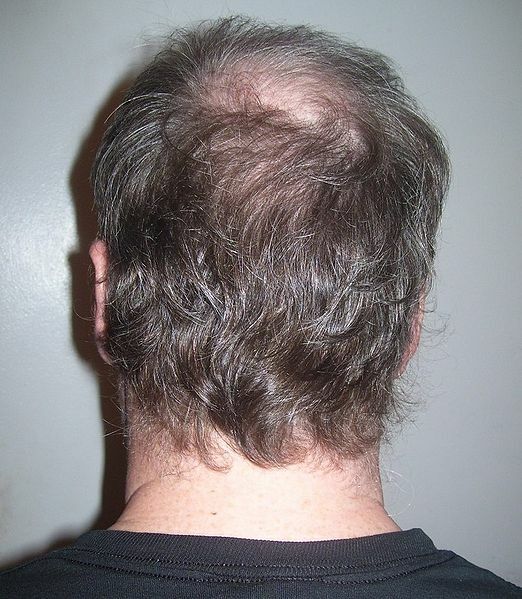 Before we dive into trying to understand more about it, look at this picture. This is a picture of the Milky Way Galaxy, which contains our Solar System with its one Star (sun). The Milky Way is estimated to contain 100 Billion stars, yes that's Billion! Remember the Milky Way is a Galaxy. 2,500 galaxies make up a Supercluster. And get this, there are estimated to be Millions of Superclusters in the Observable Universe! Think of how many stars we are talking about: 100 Billion times 2,500 times 1 Million! This number is too large to talk about! To have this number of stars you have to have incredible space. It is so incredible that astronomers have to use different measurements than we are used to called Light Years! 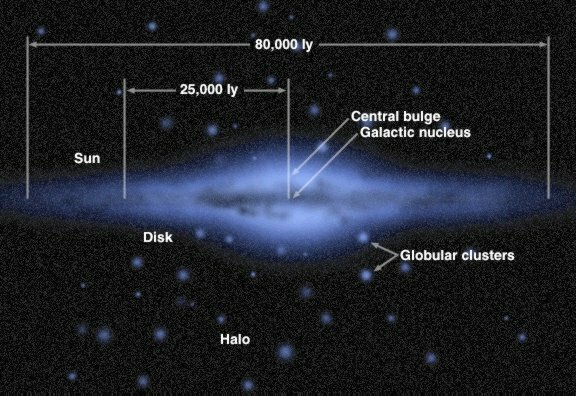 On the picture of the Milky Way it shows a distance across it of 80,000 ly. The "ly" stands for Light Year. What is a Light Year? Simply, a Light Year is the distance that light (waves or rays) travel in one year. Light is very, very fast. It travels at an unimaginable speed of 186,000 miles each second (mi./sec.). In other words in the time it takes to "snap" your fingers, light has traveled 186,000 miles. 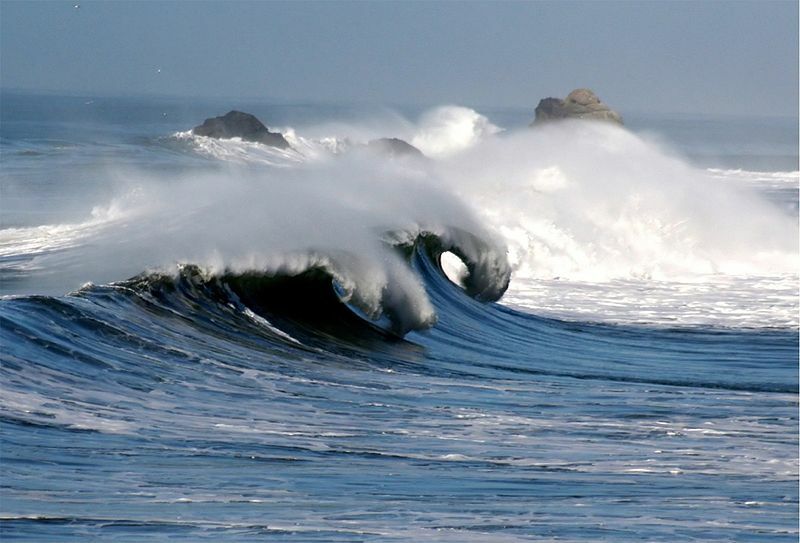 At this speed, in one second, it can travel around the surface of the earth (24,800 miles) 7 1/2 times! Or it travels to the Moon (240,000 miles) in 1 and 1/4 seconds. So a light year is the distance Light travels in one year. We know there are 60 seconds in a minute, 60 minutes in an hour, 24 hours in a day and 365 days in a year. Since we have a distance for Light's speed in seconds (186,000 mi.) lets determine the number of seconds in a year: 60 sec. X 60 min. X 24 hours X 365 days = 31,536,000 seconds. At 186,000 mi. each sec. means Light travels 5,865,696,000,000 miles in a year. This is nearly 6 Trillion miles! So let's just round it to 6 Trillion. Now back to that 80,000 Light Years shown on the above picture of the Milky Way Galaxy, which is its distance across, how long does it take light to make this small journey (small in galactic terms)? Well, as we just calculated light travels nearly 6 trillion miles in one year. That means the time it takes light to cross the Milky Way Galaxy is: 80,000 X 6,000,000,000,000 (trillion) = 480,000,000,000,000,000 (48 X 10 to the 16) years! That is a lot of years and that is just to cross the Milky Way Galaxy, traveling at the speed of light (186,000 miles each second)! Here is a cool video from a Texas location showing a time-lapse view of the Milky Way with the "naked" eye! Astronomers estimate the observable universe to contain millions of Superclusters(2,500 galaxies each) which is so vast that it would take light 10 to 20 Billion Light Years to cross traveling at 186,000 miles each second. That would take 48 X 10 to the 16 years X 10 to 20 Billion. The Hubble Telescope is now transmitting data telling us the observable universe may be another 10 Billion Light Years across, for a total of 30 Billion. So just increase the above number by 50 % and you still have an infinite distance! The Hubble was just repaired in May of 2009 to increase its life. Go hereto watch it. I hope to try to show you more about these distances, but my goal is to help you understand that we will have an infinite universe to explore (if we wish). I have heard the anology using the dove, symbol of God's Holy Spirit, to explain eternity. It goes like this. If you could suspend a brass ball in the air that was 200 miles across and let a dove brush it with the tip of its wing, every 2000 years, by the time it wore it down (due to friction of its wing) it would be just the start of eternity! Just think with a universe so vast, why would God be interested in a mere human such as you or me? The Psalmist said it in Psalm 8 : Psa 8:3 When I consider thy heavens, the work of thy fingers, the moon and the stars, which thou hast ordained; Psa 8:4 What is man, that thou art mindful of him? and the son of man, that thou visitest him? Psa 8:5 For thou hast made him a little lower than the angels, and hast crowned him with glory and honour. Psa 8:6 Thou madest him to have dominion over the works of thy hands; thou hast put all [things] under his feet: Psa 8:7 All sheep and oxen, yea, and the beasts of the field; Psa 8:8 The fowl of the air, and the fish of the sea, [and whatsoever] passeth through the paths of the seas. Psa 8:9 O LORD our Lord, how excellent [is] thy name in all the earth! And God would have had His Son, Jesus (the physical form of God), die on the cross just for one of us in order to allow us the priviledge to spend eternity with Him, learning about and exploring His vast Universe(s)! That's the bottom line. The Fibonacci Number - Fibonacci numbers or Fibonacci series or Fibonacci sequence are the numbers in the following integer sequence: 0, 1, 1, 2, 3, 5, 8, 13, 21, 34, 55, 89, 144 ............, where the next number in the series is the combination of the two previous numbers, ie. 1 + 2 = 3, 2 + 3 = 5, 5 + 8 = 13, etc. 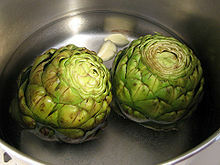 Named after Leonardo of Pisa , who was known as Fibonacci. Fibonacci's 1202 book Liber Abaci introduced the sequence to Western European mathematics, although the sequence had been described earlier in Indian mathematics. As the sequence gets beyond 5 the Golden ratio begins to apply! Approximately, 1.62 (especially as the numbers increase) it is determined by dividing the larger number by the smaller number just before it, ie. 8 divided by 5 = 1.6. Go Here for more information about the Fibonacci Sequence. 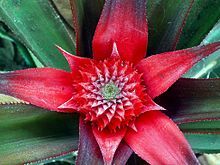 Go Here for a book, Coral Castle Explained, which presents possible evidence of how a small man was able to build this monolithic castle with rudimentary tools, alone, using placement with Phi, the Golden Ratio! Did he use an anti gravity device to place coral blocks weighing as much as 30 tons, in secret, at night? The significance of the Fibonacci Sequence is that if you graph it, it forms a spiral-like pattern. See the graph below and how this pervades the universe from our own DNA to human parts, plants, weather systems and galaxies. Here are more spirals in nature, the world and space! As shown, this spiral is in many, many things but it may reveal even more than even Scientists normally consider? Pastor Mike Hoggard, with Bethel Church of Festus, Missouri, got me thinking that the very structure of DNA may show us even more of how important the Fibonacci Number is! So important that it may even be the God of the Universe's Signature or Stamp on everything in His Creation? Go here for Pastor Mike's great video regarding this! Let's look at DNA more closely. We require a little more science first, however! From Wikipedia, "Genes are made from a long molecule called DNA, which is copied and inherited across generations. DNA is made of simple units that line up in a particular order within this large molecule. The order of these units carries genetic information, similar to how the order of letters on a page carries information. The language used by DNA is called the genetic code , which lets organisms read the information in the genes. This information is the instructions for constructing and operating a living organism." And even more specifically, "DNA consists of two long polymers of simple units called nucleotides , with backbones made of sugars and phosphate groups joined by ester bonds. These two strands run in opposite directions to each other and are therefore anti-parallel. Attached to each sugar is one of four types of molecules called nucleobases (informally, bases). It is the sequence of these four nucleobases along the backbone that encodes information. This information is read using the genetic code, which specifies the sequence of the amino acids within proteins . The code is read by copying stretches of DNA into the related nucleic acid RNA in a process called transcription ." "As first discovered by James D. Watson and Francis Crick , the structure of DNA of all species comprises two helical chains each coiled round the same axis, and each with a pitch of 34 Ångströms (3.4 nanometres ) and a radius of 10 Ångströms (1.0 nanometres). According to another study, when measured in a particular solution, the DNA chain measured 22 to 26 Ångströms wide (2.2 to 2.6 nanometres), and one nucleotide unit measured 3.3 Å (0.33 nm) long." Notice the numbers 22 and 34 Angstroms representing the approximate width and height of one DNA strand? These numbers are very close to the number string in the Fibonacci Series, ie. .... 21, 34, 55 ....... ! As Pastor Mike points out, DNA looks like a ladder that is twisted in the shape of a spiral. Curiously, the sides of the ladder are called backbones (see above)! The spine or backbone of us humans contains 33 bones, also, and is essential to supporting our bodies! Our Spine's 33 bones compare to the number 34 (Angstroms) of the height of DNA! He points out how there are 10 Commandments in the Tabernacle of God, which Jesus also compared to our bodies! And there are 10 horizontal Rungs in each length or helical turn of DNA. Note that the sides of the DNA spiral consists of Sugars and Phosphates (see above). In Revelation 10:10, it says, "And I took the little book out of the angel's hand, and ate it up; and it was in my mouth sweet as honey: and as soon as I had eaten it, my belly was bitter." The Amino Acids, in the DNA and mentioned above, consist of a total of 22. Curiously, the total number of letters in the Hebrew alphabet, which is the language of the original text of the Old Testament, is also 22! The Hebrew Old Testament begins with the Book of Gene-sis and our lives begin with Genes made from our DNA, which is in a Fibonacci spiral, with its width to height ratio equaling the Fibonacci Ratio! Look at the Human Hand Skeleton (above) and note that if you take the length of the finger tip (Distal) and middle (Intermediate section), the two are equal in length to the bottom part (Proximal) and if you look at the next bone connecting to the wrist (Metacarpal), it is equal in length to the previous bone and the middle bone! Watch the animation. So, what, this is not a Spiral, you say? The point is that these distances add up just like the numbers in the Fibonacci Sequence (previous 2 numbers totaled = the next number)! And as noted earlier, our lives begin with our DNA and Genes, whereas, the Bible begins with Genesis. 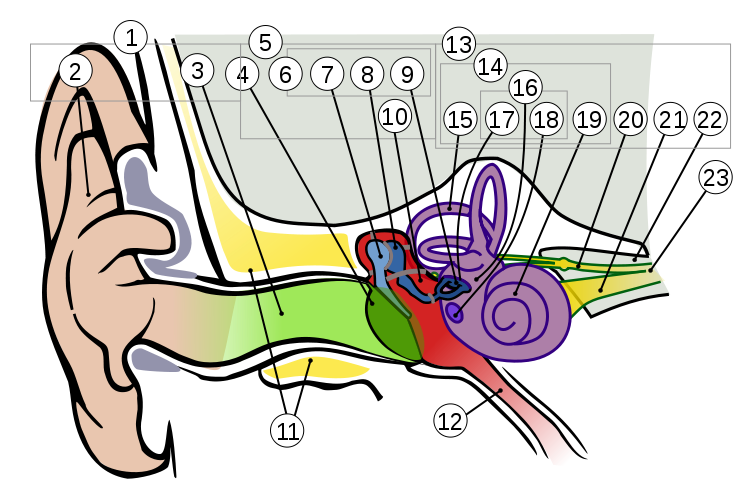 And then our Embryo develops in the shape of the Fibonacci Spiral, also! See the image above. Here is a great article discussing how privileged planet earth is in its placement! Dominic Halsmer titled "The Coherence of an Engineered World" in the journal International Journal of Design & Nature and Ecodynamics. The paper reviews the work of a number of leading ID proponents and concludes that from the macroscale of the universe, to the structure of our galaxy, to the microscopic features of life, nature shows evidence of design. The following 5 main groups represent the basic categories into which origin models can be divided over a broad spectrum from atheistic evolutionism to young earth, recent creationism. 1: Atheistic evolutionism (naturalistic evolutionism): The universe and all the physical laws of nature were created by chance during the Big Bang about 15 to 20 billion years ago. We exist through a combination of random processes known as "evolution". There is no purpose or intelligent force which has directed our evolution. We are here only by chance, religion is a natural development in our evolutionary 'progress", and when we die, we no longer exist. Examples: Isaac Asimov, Carl Sagan, Stephen Jay Gould, John Gribbin, Stephen Hawking, Richard Dawkins, Arthur N. Strahler. 2: Deistic evolutionism: A supernatural force created the Big Bang, and set down all the physical laws. This force is no longer involved in the day-to-day operation of the universe. We exist via "evolution", and although a supernatural force may have initiated the process, we are here by chance. 3: Theistic evolutionism: God is the supenatural force who created the Big Bang and set down all the physical laws in order for evolution to occur. He used evolution to "create" the right environment and the right vehicle in which to place a living soul. When the time was right for Adam to appear, God took an evolved pre-man, and gave him a spirit and/or soul to create man in the image of God. This theory gives evolution a purpose, and in this way, it differs from Deistic evolutionism. Examples: B.B. Warfield, James Orr, C.I. Scofield, Derick Kidner, Howard Van Till. 4. Old Earth Creationism: This category describes theories that accomrnodate the belief in an ancient earth with the belief that God created more-or-less as described in Genesis 1. In all these theories, Genesis is interpreted to provide the millions of years needed for fossil formulations. There are two subcategories under Old Earth Creationism which vary depending on how literal Genesis 1 is interpreted. They are: 4a. The Gap Theory and 4b. The Day/Age Theory. 4a: The Gap Theory: The belief that there is a considerable amount of time between Genesis 1:1 and Genesis1:2. and that the cosmos, which was originally created long before the creation week in Genesis, became without form and void. In the creation week in Genesis, God "re-created" the earth and told mankind to replenish it. Some proponents of the Gap Theory believe that geological strata were created during the time before the re-creation of the world, and do not believe that Noah's flood was world wide. This theory has its origin with the founders of modern geology (e.g. T. Chalmers, H. Miller), and is referred to by some as the "ruin-reconstruction" view. This view is found in the Scofield Reference Bible, Dake's Annotated Reference Bible, and the Newberry Reference Bible. Examples: Thomas Chalmers; Hugh Miller; G.H. Pember (Earth's Earliest Ages, 1884); Arthur Custance (Without Form and Void, 1970). 4b: The Day/Age Theory: The creation days in Genesis describe creative periods of time, not six literal days. During each creative period, God increased the complexity of life by creating new life forms while also changing the earth to accommodate these new forms. There are variations on the Day/Age theory, and they differ according to how much the appearance of new organisms in the fossil record is attributed to God's direct intervention, or due to the process of God-directed evolution. 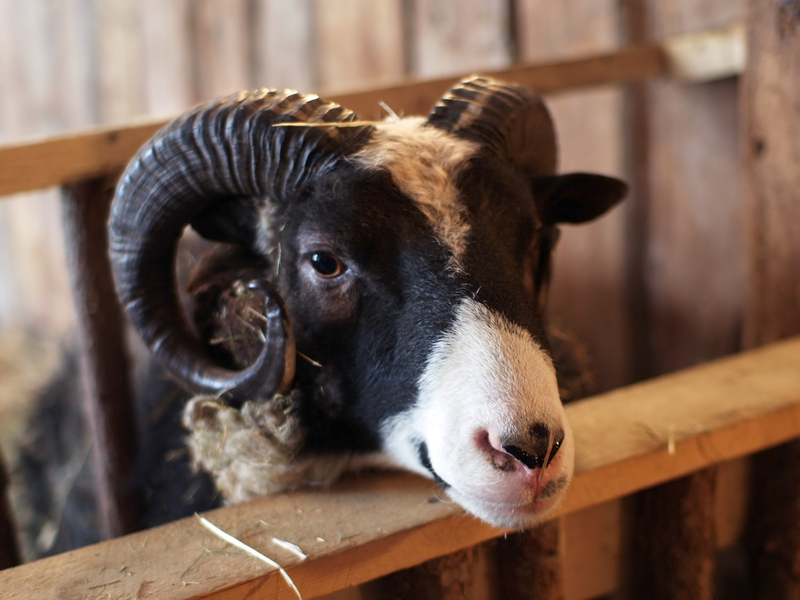 Some proponents of the Day/Age Theory believe that we are currently in the seventh day (D.A. Young, G. Schroeder). Progressive creationism (H. Ross) is based on the Day/Age Theory. Examples: Bernard Ramm, Kenneth Taylor, Millard J. Erickson, James Montgomery Boice, Gleason Archer, Hugh Ross (Reasons to Believe), Christianity Today, Davis A. Young, Robert C. Newman, Pattle T. Pun. 5: Young Earth, Recent creationism (Scientific creationism): God created all matter in 6, 24 hour days, sometime about 10,000 years ago. God created everything with the appearance of age. It is in total disagreement with modern scientific dating methods for ages beyond 10,000 years, but is in total harmony with the literal translation of the creation week. Examples: Henry H. Morris, Duane T. Gish and those associated with the Institute for Creation Research and the Creation Research Society; Ken Ham (Answers in Genesis); John Mackay (Creation Research, Australia), Gary Chiang (if anyone cares). "For the scientist who has lived by his faith in the power of reason, the story ends like a bad dream. He has scaled the mountains of ignorance; he is about to conquer the highest peak; as he pulls himself over the final rock, he is greeted by a band of theologians who have been sitting there for centuries." Here is a video on the particle accelerator in Cern Switzerland, courtesy of "How Stuff Works" that describes what they hope achieve there. They want to study the big bang which they claim happened 13.7 billion years ago! This is a debatable proposition but still the video sheds light on particle physics for anyone interested. As a retired civil engineer I remember studying Physics, which is the applying of mathematics or formula to explain science. We encountered this strange term called entropy , which is a measure of energy, usually the loss of unless we are talking about a closed, highly controlled system. In layman's terms think of it as the aging or natural deterioration of all things. This term by itself cries out against the THEORY of Evolution because it proposes that mutations occur over and over only in a controlled system allowing these mutations to keep the process from deteriorating but becoming more adaptable, more organized and Naturally Selected to survive and reproduce! Well God said this would happen even to the universe in Hebrews 1:10-11 (10) And, Thou, Lord, in the beginning hast laid the foundation of the earth; and the heavens are the works of thine hands: (11) They shall perish; but thou remainest; and they all shall wax old as doth a garment;! Here is a great video covering a lot of what I have already shown you on this page and what follows in the Microscopic Universe, called God of Wonders . I thought it appropriate to add to this site exploration of the microscopic universe because with the advances in imaging, microscopes and computers it is opening up to a view that is just as complicated, if not more, than the Cosmos! Here is a great you tube video that shows how complicated and intricate even the lowly bacterial flagellum is debunking the THEORY of evolution! Produced by, Michael Behe, PhD, who is one the primary voices for "irreducible complexity" (IC) the argument that evolution could not occur because even these simplest of systems could not evolve and function enough to even reproduce themselves, a mandatory requirement for further evolution of complexity! Here is his argument in more detail. To be fair and balanced, which Fox News (excluding the entertainment, opinion pieces) comes closest of all that's out there, here is the individual, who is most vocal against IC, Ken Miller, PhD, having championed the argument against it at the Kansas Board of Education evolution hearings . There are additional videos of his to view on the same page. But basically he argues that if you take away 40 of the 50 proteins, severely reducing it's complexity, you find a syringe like device, debunking the idea that the entire structure has no evolutionary value. I and others would argue that he is dismissing even the irreducible complexity of these 10 proteins. However, when you reject the idea of an intelligent designer, you have no problem "cherry picking" components to validate your argument. Still, you have to decide for yourself. As a retired engineer, I have and thus I present these arguments to promote my (actually The God of the Bible's) thesis! Because of its complexity and shape, the Mandelbrot Set has been called the "Thumb" or "Finger Print" of God! Also, because of the radiating spline like features it has also been called the "Vine" of God! The Old Testament Prophet Daniel (of Daniel & the Lion's Den notoriety) said thousands of years ago that as we get closer to Jesus' return, knowledge will increase! Could this be an example of how, without the increase in knowledge brought about by the invention of the computer, we would not really understand the significance of this discovery! I explore this scripture in more depth HERE if you have more interest in this discussion?